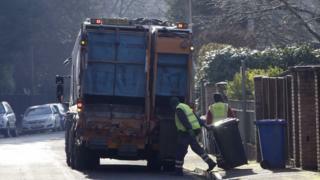 Two council bin lorries and five vans were driven for three months without MOTs due to a typing error. One of the vans was involved in a crash, and a worker has been suspended while South Norfolk Council investigates how the typo occurred. The MOTs expired in May and all seven vehicles are now off the road after the error was discovered on Friday. An employee had "incorrectly typed 2019 and not 2018" as the renewal date on a maintenance database, the council said. "Seven out of our fleet of 55 vehicles" serving the Ketteringham recycling centre were affected, the council confirmed; adding that despite this they had all "passed their regular six-weekly safety inspections". "As soon as we were made aware of the situation, the vehicles were taken off the road and we immediately arranged for those vehicles to be booked in for MOTs," a spokesman for the council said. "A staff member has been suspended pending a full investigation." "Our Ketteringham depot has been in operation for 40 years... and this unfortunate administrative error is not a reflection on the hard work and dedication of our bin crews," he added. People needed hospital treatment when one of the seven vehicles was involved in a collision with a car on the A146 in July, the Local Democracy Reporting Service said. The council spokesman said the DVLA and Department for Transport had been made aware.